Be thankful..The Lord is GOOD!!!!!!!!! 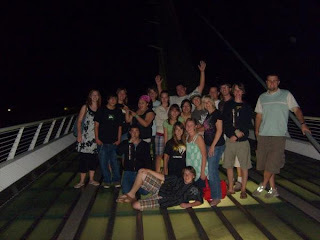 Cultivation Youth from reno vineyard on Vimeo. ok so the first two days it was the yerington youth group and the reno youth group. but then we got there on thursday and we went to the church. so the first thing they did was worship and it was really really LOUD . but after that jimmy jon talked about us being God's children and him being our abba. so after a while of him talking the band started worship. and I all most started crying but then taylor started crying then Jared started crying and i started crying and pretty soon every one was crying and it was all becasue God was there and i know for me he was just filling me up. So i believe that because of this night we were all vulnerable and our walls were tooken down and that is why Reno and Yerington love each other so much. Then the second day we had work shops. the works shops were on what ever you felt God wanted you to do. There was worship, minstering , hearing, caring , and art. So after the work shops Jeremiah spoke. ( idk what on though). Then when we got back Jimmy Jon spoke and he spoke about the space between heaven and earth. Then that night durring worship was the first time that people would fall on the floor and just get filled up with the holy spirit. Then saturday we had our out reach and what we did was we went and cut down blackberry bushes and pull ivy. the blackbush pulling was very painful but some how we still had fun or at least i did. Then that night was the concerts and i swear the ground was moving. it was the most amazing thing ever. i think that that was probably one of my favorite parts. it was soooo much fun and amazing. people again were being filled up and other people were worshipping . it was awesome. and then the next day was church and we had drive home and every one was sad we had to leave. Oh man, Oh man. this trip was super amazing! not only did we form some awesome relations ships with the Yerington youth group. But God showed up!!!! It was so cool. I mean the the Holy Spirit came down on us like a coyote on a field mouse. I mean you could see people being filled be up: some where crying others were laughing uncontrolubly. It was super crazy. So anyways the car rides were fun too and everyone fell in love with eachother! Ahahahaha. (I mean really fell-for-each-other, Reno girls likin' Yerington boys, Reno boys likin' Yerington girls) What a mess! So there was a lot more but it will take too long to write! Hey guys! So on Thursday night some of us from Reno went down to Yerington for youth group. It was a love fest reunion. Great to see the Nevada youth group back together again! Anyway...we listened to Acts chapter 2 where the promise of the Holy Spirit was fulfilled in Jerusalem and came like wind and fire on everyone waiting in the upper room. It brought tongues like fire and everyone started speaking in different languages about the glory of God. It was so loud that people outside that had come from all over the Mediterranean could hear them talking in their own languages about God. So then Peter connected the dots for them and showed them how Jesus is God. It was through Jesus that God would change everything. When Jesus still walked the earth, they expected the Messiah to rule as a physical King of Israel here on earth. So when Jesus died, all those hopes of him being the Messiah were smashed. Peter explained to them that it was through Jesus that God did establish the King of Israel, but bigger than just on earth. It changed the way that all people related to God. Men, women, children, slaves, and people from all nations were equal and could have equal access to God. So Peter gave an alter call. And the church grew from between 100-150 to 3000 in one day. They believed, repented and were baptized in the name of Jesus. Then they all started living together in community, sharing everything, eating together, talking about Jesus everywhere they went, praising God together. No one lacked anything. And miracles started to happen. Here's Acts 2:42 "They devoted themselves to the apostles' teaching and to the fellowship, to the breaking of bread and to prayer." So Jon made this matrix with some sweet drawings of a book, a guy on his knees praying, a hamburger, and stick figure people with their arms around each other (black, white, red, and an Asian child). And here's the question: what are you doing to continue what God had done and is doing in your life? Of those four things listed in Acts 2:42, what are you doing this week? Well this is totally cool. I get to be the first blogger on the camping trip! Oh ya! Thats so Rad! Okay so this camping trip starts for on Friday at 4:30. Dana comes to pick me up and I meet her work friend. Next we go back to Dana's, and leave again to pick up Harmonee. We come back, unlode the food from Dana's house, then Drew shows up. We unlode his car, pack it all in to Dana's car, and get on the road! Now were in the car... Jamming and just hgaving a good time. Then Drew is driving and gets on a little turn around thing and starts going the way, Harm and I think is the wrong way, Dana tells us differently. So were driving along and having a great. fun car games and just having fun. So now we're going along and at this point I don't even know were we are and Dana is on the phone with James and he tells us, thats we're going the wrong way! Oh Yeah! Go Us! so we stop at a Burger King, get Dana and Drew so crowns! ( Which Dana hated because she never wore it). Then finally get there at 2:30 in the morning. Now it's Saturday, we get, have sourdough pancakes for breakfast, they were pretty great. Then we explored the caves. Went back to camp for lunch, then went to the lake, (Which I got to drive to) *Thank you James and Sarah* We swam. And Dana's car almost ran out of gas. hahahaha. Then Saturday night we played animal and Dana braided: Mine, Harmonee's, Ericka's and Alex's. It was Awesome! Then we played Phase 10 and that was prett fun. Sunday morning we ate breakfast and cleaned up camp. Then went to another cave... that was cool. Then we rode home and it was great! Good Weekend! Actually rose isn't my middle name. Thats just my nickname at school. Hey everyone, so I was thinking...and I thought we should have a section for prayer requests whether they are for us or someone else we can then pray throughout the week. Oh I also thought maybe we could post how God has answered some of our prayers, as encouragement (but if its too personal that's okay). Alrighty so given that it has taken me a little while to make this post I have a couple requests to begin with, but I'll do them on a separate comment so we can just scroll through the comments and see the different prayer requests. Have a great weekend everyone. Hey guys, i don't really understand it if. if you guys can help me with that, it would be great. It really is confusing for me. k love you guys. I wanted to share this with you guys last night at youth group, but I was recovering from my stomach bug and decided not to expose all of you. You're welcome. So Sunday night I had a dream that something bad happened to one of my boss's three year old twins. In the dream, I knew it was Rosie and not Isabel. When I got up that morning I prayed for them but also logged the dream in my journal and continued to hang out with God. I made a list in my journal of some things that I wanted to seek God in a more committed way. One of them was more ways to show His love to my co-workers. So I went to work on Monday morning. And just like in the dream, I was with my boss and another co-worker when his phone rang and it was his babysitter. He tried to calm her down and ended up walking out of the room saying, "Do you need to call 911?" At that point, I went back to my lab and started praying God's protection over Rosie, knowing there had to be a connection with my dream the night before. A few hours later, my boss came back to work, so I knew that everything would be ok. At the end of the day, he came into my lab to double check on a project and I asked him if everything was ok at home. He said yes, that the babysitter was putting sunscreen on Rosie and she began to have an allergic reaction to the sunscreen and her eyes and other parts of her face began to swell. So the babysitter was a little freaked out. When he said it was Rosie, I immediately felt my face get red. I realized how clearly that God was speaking to me that he could tell me which of his kids specifically to pray for. Then I told him that I knew it was Rosie because I had a dream about her the night before and that when he got that phone call and I heard him say something about calling 911, I went back to the lab and started praying for Rosie. His mouth dropped and he said thank you and how weird it was that I had that dream. He couldn't get over how weird it was but he was very grateful. Isn't it cool when God shows people how much that he loves them and their family? For God to give me a dream and have me praying that nothing worse would happen to his daughter before and while it was happening, that's huge! We serve an amazing God that wants to be in our lives and show us how much he loves us! I'm learning through many mistakes and missed times of sharing God's love, how to be obedient to share it when he presents me the opportunity. I'm so glad he doesn't give up on us when we are disobedient and make mistakes. And how fast is he? I asked him that morning to be able to share his love with my co-workers! Did you guys all like the movie? I wrote a little review on my blog if you want to check it out. Hey guys, any thoughts on the questions about the story in John 4:1-26? Here's the link for the Vancouver conference. Remember sign up by June 1st with $50 deposit. Do you want to be notified when someone posts a blog or comment? Let me know and I'll put you on the email notification list so you can keep up with everyone's comments. Hey Redemption Youth! It's Nuti. This blog was created to allow for discussion of your experiences as we embark on the Outflow series. Feel free to start your own discussions with each other and ask questions. You guys can share your stories and answer each others questions. If you guys like this option, we can keep it up past teaching and journals of the series as the series is just a tool to get us living this stuff all the time. Let's let God into our lives so we can pour out on those around us. Are you ready to jump in?